Our Native Easter Lily, just in time for Easter! This Bosky Dell resident was featured on the cover of the Home and Harden section of the Oregonian in March. Click here to view the article and access the video, and see more photos. Check out this new article from Metro featuring Bosky Dell and woody native plants! 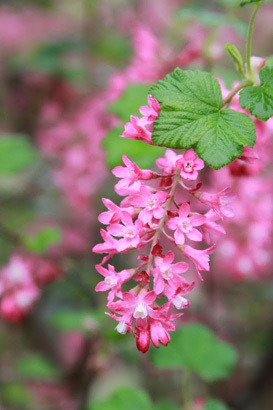 Ten Woody Plants Every Oregonian Should Know. 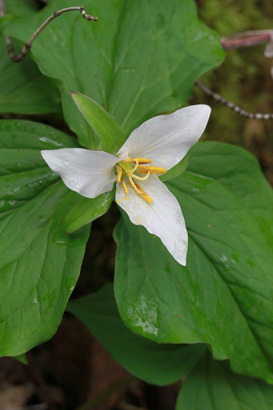 The Red Trillium, Trillium kurabayashii is in bloom along Fields Creek, come by for a visit and take a look! 3/21 Mt. Huckleberries are here! Plant some in your yard for when you can't make it on a hike to a high mountain lake, and for quick snacks or pie garnishes! They are so delicious!!! These are beautiful specimen plants with cool shapes! We have some 1 gallons as well. Bare root Sword Ferns are available now! $3 each for large ferns 1-2 gal size. The most economical way to plant! Great for restoration and erosion control. Last chance this year! Our resident young Bald Eagle, surveying his domain. 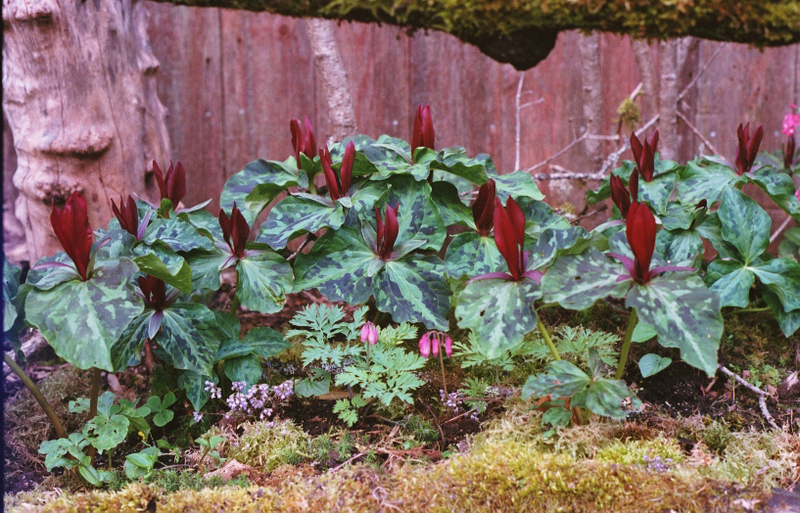 BAKERS DOZEN-Beautiful Trillium Bulbs in a tub planted together with beautiful soil and top dressed with native moss loaded with little native woodland treasures! 13 Trillium in a pot together @ $72.00, regularly $130.00. You can also purchase one bulb @ $10.00 each. They are large, beautiful, old bulbs. We have 15 available. While supplies last! THE PORTLAND TREEBATE PROGRAM IS BACK! That's right, if you plant a tree on your residential property in Portland, Environmental Services will send you a rebate of up to $50. We have plenty of eligible trees available! 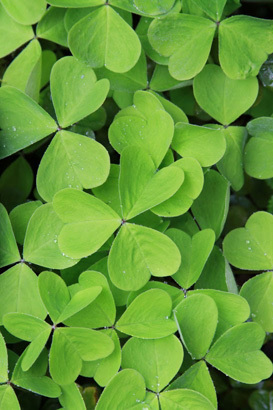 Plant before April 30 to be eligible, and get them in the ground duing the best planting time! We have native seeds for sale, fall is perfect for planting! 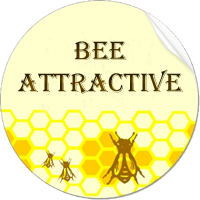 Individual species and bee/butterfly mixes for sun or shade. Custom mixes available. We have plenty of packets available now and we'll start selling mix-your-own bulk seeds soon. We have small quantities of many species not listed, so if there's something specific you want, just ask! 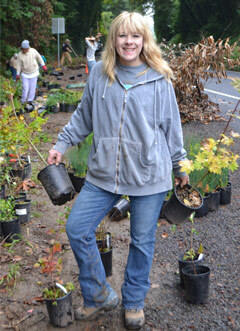 Bosky Dell Natives provided Willamette Valley seeds to assist with the restoration of Cully Park. You can visit the video below to view the ceremony with our friend Judy Bluehorse Skelton. The Let Us Build Cully Park! Tribal Gathering Garden from PrettyGoodProductions on Vimeo. CHEERS TO VOLUNTEERS!!!! We are currently looking for temporary part-time help at the potting table. Will trade plants for your garden for some of you time at the potting table! Call us or email if you are interested. 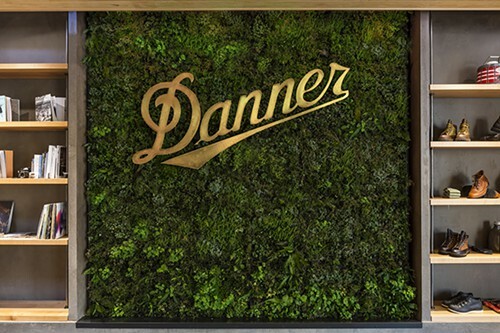 Check out our 100% native interior greenwall at Danner Boots on Burnside. Made of 30 modules, it took months to plant, and we love how it turned out! We hope to do more greenwalls in the future with funky rocks, mosses and lichens and beautiful plants. It's accross the street from Powell's City of Books in the hallway between Ace Hotel and Powell's, stop in if you're downtown! It's Huckleberry season - YUM! Is your garden ready? The first huckleberries are ripe, more in August. Here are some of my mom's favorite huckleberry recipes. We have beautiful plants for sale with berries on them for your garden! Large and small. Learn how to make fritters, tarts, liquer, muffins, pancakes, and pie! JUST ARRIVED! 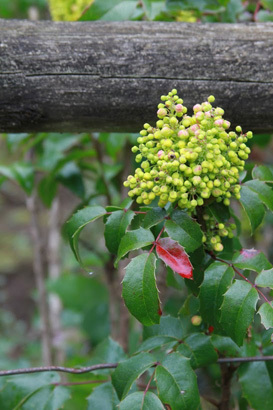 Oregon Wax Myrtle. Assorted sizes. Evergreen screen or hedgerow plant 12-18' tall. Gourmet bird food. Makes great neighbors! Plant Native -- Keep Oregon Green! ...I'm an Oregon Native! 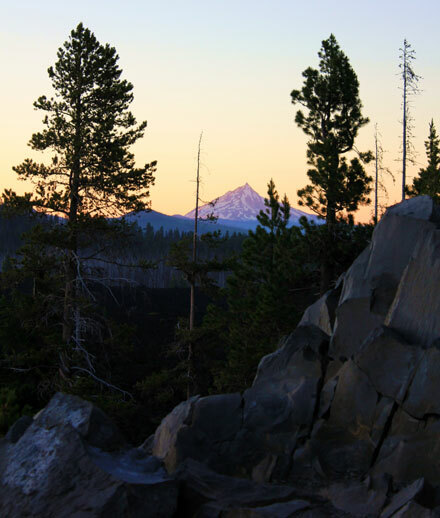 Check out our Facebook page for more Oregon photos. The Student Watershed Research Project is a self-support program of Portland State University’s Environmental Science and Management Department. This great group of people work with students, teachers, scientists, businesses, governmental agencies, and community groups to link watershed education with the collection of high quality data. SWRP is on a mission to develop awareness, knowledge, commitment, and skills leading to a responsible behavior and productive actions to benefit water quality and watershed resources. The Tualatin High School IB Environmental Systems and Societies class recently visited Fields Creek to test its water quality and investigate what lies within and around that water. We found incredible things and gained great knowledge of how the water quality we study in class actually applies to the outside world. For students, it is truly fascinating when you get to experience science first hand. My classmates, teachers, and I discovered many things during our visit to Fields Creek. One thing in particular that stood out to my classmates and I were the aquatic macroinvertebrates. These insects have no backbone and are visible to the naked eye, but are quite small. They live in the water for all or part of their lives, so their survival has a great relation to the water quality. Macroinvertebrates are sensitive to different physical and chemical conditions. If there is a change in the water quality, then the macroinvertebrates community may change as well. So the abundance of the macroinvertebrates community composition in a water body can be used, along with other abiotic indicators, to provide an estimate of a water body’s health. Our class tested multiple sites and found that Bosky Dell had a huge diversity of macroinvertebrates. We found many Mayfly, Caddisfly, and Stonefly larva, which are sensitive to water conditions, and only live in healthy streams. We estimated that we caught a total of 75 different organisms! At other sites we tested we only caught about 20 organisms, and 19 of them were tolerant to bad water conditions. My fellow classmates and I are extremely grateful to Bosky Dell Natives for letting us use their stream for our water quality testing. Not only did we gain a great deal of knowledge during our visit, but also restoration at Fields Creek has been a success based on our findings. Thanks Digger, for Digging us! 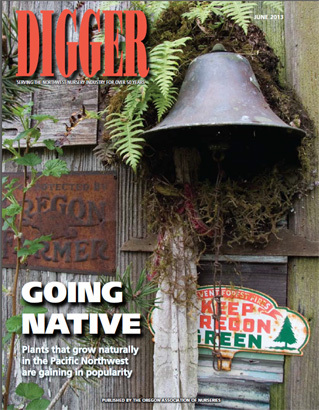 We're on the cover of Digger Magazine (Oregon Association of Nurserymen) this month. Here are several photos of plants from our gardens featured inside! Photos by Peter Szymczak and Kurt Kipp. Check out Lory and Camp Smokey at Bosky Dell on Garden Time! Looking for the Perfect gift for a plant lover in your life? 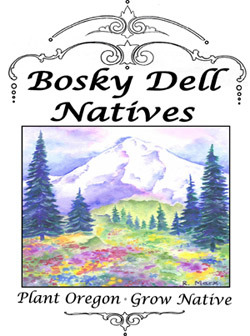 We have Bosky Dell Natives gift certificates available, pay by phone and we can mail it to you, or stop by and pick one up! Gardening - It's for the birds! Are your birds well fed? 9/1 THE PORTLAND TREEBATE PROGRAM IS BACK! That's right, if you plant a tree on your residential property, Environmental Services will send you a rebate of up to $40 (up to $50 for native trees). Get all the info here or if you already purchased a tree, fill out your treebate form here. 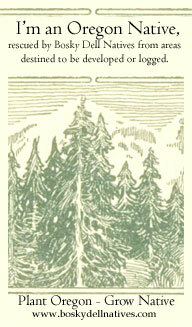 Native trees that qualify include, Bigleaf maple, Grand fir, Red alder, Pacific Madrone, Pacific dogwood, Oregon crabapple, Ponderosa pine, Bitter cherry, Douglas-fir, Oregon white oak, Cascara buckthorn, western redcedar, and western hemlock. Feel free to call us or email us for current availability. Check out our new sign on Borland Rd! 10/20 CHEERS TO VOLUNTEERS!!! Thanks to all the volunteers that showed up last week, Phase 2 of The Ditch Restoration Project was a great success! Many thanks to all who helped! We have posted a ditch restoration photo gallery on our facebook page, and we planted approximately 1200 Willamette Valley natives! Be sure to watch for them this spring as you drive down Borland Rd. We really need your help for this project! We will be restoring the ditch that runs from Bosky Dell Lane to the Fields Creek Bridge on the downhill side. This project is designed to be a demonstration of how important ditches are. phase 2 will be planting the ditch and a follow up removal of invasive species that snuck back in after Phase 1 (see below). DON'T DITCH THE DITCH. Please help in any way if you can! We will be serving some snacks and at the end of the party we will be giving thanks for the opportunity to restore the ditch. Please show up in comfortable clothes you can work in and get dirty, and please call me at 503-638-5945 if you have any questions. It is volunteers like you that help us keep our rivers and streams healthy and clean! 7/31 Oregon's Mt. Hood Territory Video featuring Bosky Dell! Read the story here! We will be restoring the ditch that runs from Bosky Dell Lane to the Fields Creek Bridge on the downhill side. This project is designed to be a demonstration of how important ditches are. They act as a channel to divert water and direct it downhill to our streams and rivers. I want to bring awareness as to how much ditches can and do help with keeping our rivers clean by trapping sedimentation and impurities that travel downhill, off the pavement with the rain. We want to plant this ditch with lots of sedges, rushes, ferns and wildflowers. The idea is that it will be beneficial to wildlife, beautiful for people to see as they drive down the road, protect fish and wildlife, and help clean up our rivers and streams. These plants have a big job ahead of them to trap all of these impurities and protect the streams and rivers. With years of filtering and collecting debris, the lower end of the ditch may need to be scooped out and replanted to enable it to continue to cleanse the water path. If this needs to be done, it's just a good indicator as to how beneficial the plants were in protecting the stream. I hope that this ditch project will educate the public and inspire others to do what they can, with ditches everywhere. Phase 1 will be the removal of invasive species, while phase 2 (this fall) will be a follow up removal of invasive species that snuck back in, and planting the ditch. DON'T DITCH THE DITCH. Please help in any way if you can! We will be serving some snacks and at the end of the party we will be giving thanks for the opportunity to restore the ditch. Please show up in comfortable clothes you can work in and get dirty, and please call me at 503-638-5945 if you have any questions. It is volunteers like you that help us keep our rivers and streams healthy and clean! Beginning March 1st, Bosky Dell Natives will be Open 7 days a week! VOLUNTEERS WANTED: Share your time, knowledge, and love for native plants! Fields Creek needs some extra TLC, and any help would be greatly appreciated, not only by us, but the native residents that reside here! Even an hour or two makes a difference! THANK YOU TO EVERYONE WHO HAS TAKEN THE TIME TO HELP US, YOUR TIME IS GREATLY APPRECIATED!! WHERE HAVE ALL THE HONEY BEES GONE? Learn all about Mason Bees in this informational article. OREGONIAN ARTICLE MENTIONS BOSKY DELL: Clown around with the colorful monkey flower by Ketzel Levine. Ketzel Levine, former senior correspondant for NPR mentions Bosky Dell in her recent article covering Mimulus. Above is a photo of the colorful Pacific Banana Slug. These large slugs are in the family Arionidae and the subfamily Ariolimacinae. While the Pacific Northwest is home to a variety of slugs, not all of them are native. The native species play an important ecological role in the natural environment, but exotic species tend to ravage our crops in an often irritating and sometimes expensive manner. Looking for an inspirational day trip....try Crater Lake! NEW PHOTO GALLERIES - Check out our new photo galleries from all around Bosky Dell. Photo prints on archivial watercolor paper available upon request via email. 6/24 The Oregonian Features Field's Creek Video! Click HERE and HERE for more infor on Rain Gardens! Ever wonder what happens when you don't get the proper permits before beginning construction? Read this to find out why nobody is exempt from the law, and why you should always have the proper permits first! 100% cotton heron Hoody's, T-shirts & bags have arrived. Limited quantities. This design features a custom watercolor painting of a heron in a wetland transformed into a vibrant screenprint. Come check them out before they're gone! JUST ARRIVED! Trillium Lake painting - High on Hood screen prints on 100% cotton T-shirts, tank tops, sweatshirts, Organic cotton grocery store tote bags - limited quantities - many one of a kind! 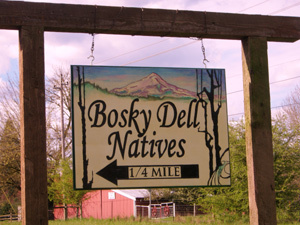 "The Reincarnation of Wi-Ne-Ma's Homeplace"
"Fields Creek Riparian Restoration - a Tualatin River basin restoration project"
© the Bosky Dell logo, all original art work, photography and web page contents are the property of Bosky Dell Inc.